Alternate access mappings direct users to the correct URLs during their interaction with Microsoft Office SharePoint Server 2007 (while browsing to the home page of an Office SharePoint Server 2007 Web site, for example). Alternate access mappings enable Office SharePoint Server 2007 to map Web requests to the correct Web applications and sites, and they enable Office SharePoint Server 2007 to serve the correct content back to the user. Alternate access mappings have been implemented because there are common Internet deployment scenarios in which the URL of a Web request received by Internet Information Services (IIS) is not the same as the URL that was typed by an end user. This is most likely to occur in deployment scenarios that include reverse proxy publishing and load balancing. Alternate access mappings must be configured for load balancing, even though it generally does not apply to host header site collections. The default zone public URL should be set to a domain URL that is appropriate for all users to see. Unless this is done, the names of Web servers or their IP addresses may be displayed in parameters passed between pages within Office SharePoint Server 2007. Host-named site collections cannot use alternate access mappings. Host-named site collections are automatically considered to be in the Default zone, and the URL of the request must not be modified between the end user and the server. A reverse proxy is a device that sits between end users and your Web server. All requests to your Web server are first received by the reverse proxy device and, if those requests pass the proxy's security filtering, the proxy forwards the requests to your Web server. Reverse proxies can perform advanced functionality, such as receiving a Web request over the Internet by using HTTPS (Hypertext Transfer Protocol over Secure Socket Layer), but forward the request to the server by using HTTP. This is referred to as "off-box SSL termination." Reverse proxies can forward the request to a port number other than the port on which the request was originally received. Reverse proxies can also change the HTTP Host header field. Office SharePoint Server 2007 is compatible with many reverse proxy servers, but in the following example the publishing rule is from the reverse proxy software, Microsoft Internet Security and Acceleration (ISA) Server 2006. ISA Server 2006 includes a publishing wizard to help you create a publishing rule for Office SharePoint Server 2007. After the rule is created, you can modify it at any time. This is referred to as an asymmetrical path. Microsoft Office SharePoint Server 2007 does not support asymmetrical paths. The path of the URL must be symmetrical between the public URL and the internal URL. In the preceding example, this means that the "/sharepoint/default.aspx" portion of the URL must not be modified by the reverse proxy device. The first two figures in this example show a modified publishing rule where the Forward the original Host header option is turned off to help demonstrate the flexibility of alternate access mapping. If the Forward the original Host header option is selected, the public hostname also serves as the internal hostname when configuring alternate access mapping. The following figures show the Listener tab and Public Name tab on the properties sheet for the rule. These properties define the URL to use to access your Web application. This URL is actually the URL of your reverse proxy server, which forwards the request to your server running Office SharePoint Server 2007. The end user's URL is made up of the public protocol, the public hostname, and the public port number, as shown in the following table. The following figures show the To tab and Bridging tab on the properties page for the rule. These properties define the URL that the reverse proxy server uses to forward the request to your server running Office SharePoint Server 2007. The URL of the server running Office SharePoint Server 2007 is made up of the internal protocol, the internal hostname, and the internal port number, as shown in the following table. At this point, the reverse proxy server is configured to receive Web requests from end users at https://www.contoso.com and forward them to your server running Office SharePoint Server 2007 at http://sharepoint.perimeter.contoso.com. After you have configured the reverse proxy server publishing rule, configure your Web application and alternate access mappings to match the publishing rule. You can do this by extending an existing Web application to an additional IIS Web site specifically for the reverse proxy publishing rule. You can also create a new Web application for this publishing rule. The values you need to enter are the same in either case. Use the following procedure to extend an existing Web application. From Administrative Tools, open the SharePoint Central Administration Web site. On the Application Management page, in the SharePoint Web Application Management section, click Create or extend Web application. On the Create or Extend Web Application page, click Extend an existing Web application. On the Extend Web Application to Another IIS Web Site page, select a Web application. 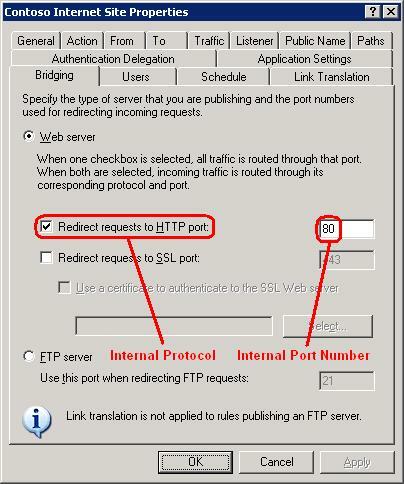 When you have selected a Web application, enter values for the port, Host header, and SSL fields, based on the internal URL properties defined in "Configuring the reverse proxy server" earlier in this article. In the URL field, enter the public URL defined in "Configuring the reverse proxy server," as shown in the following figure. Select an alternate access mapping zone to assign this extension of your Web application to. There are a maximum of five zones available for each Web application. In this example, we will use the Internet zone. All of the zones provide the same functionality, although the Default zone will always be used for certain features, such as sending administrative e-mail messages to site collection owners. To create the IIS Web site, click OK.
After you have completed these procedures, verify that your public URL was created correctly in alternate access mappings and then add your internal URL. Unless your internal URL is the same as your public URL, this is an extra step that you must perform manually. Use the following procedure to view the Alternate Access Mappings page. From Administrative Tools, open Central Administration. On the Operations page, in the Global Configuration section, click Alternate access mappings. On the Alternate Access Mappings page, select the Web application to publish through the reverse proxy server. At this point, you should see alternate access mapping URLs assigned to your Web application, as shown in the following figure. The public URL from the reverse proxy publishing rule has been assigned to the Internet zone of your Web application. Use the following procedure to add the internal URL from the reverse proxy publishing rule to the Internet zone of your Web application. On the Alternate Access Mappings page, click Add Internal URLs. Type the name of the internal URL and select the same zone that you used for the public URL. In this example, we will use the Internet zone. At this point, you should see that the additional URL is assigned to your Web application (in the same zone as the public URL of your reverse proxy publishing rule), as shown in the following figure. When a user browses to https://www.contoso.com, the Web request will be received by the reverse proxy server and forwarded to http://sharepoint.perimeter.contoso.com. Office SharePoint Server 2007 will then receive the Web request, see that the URL of the request is http://sharepoint.perimeter.contoso.com, find that this URL is assigned to the Contoso Web application, and return the content from that Web application. 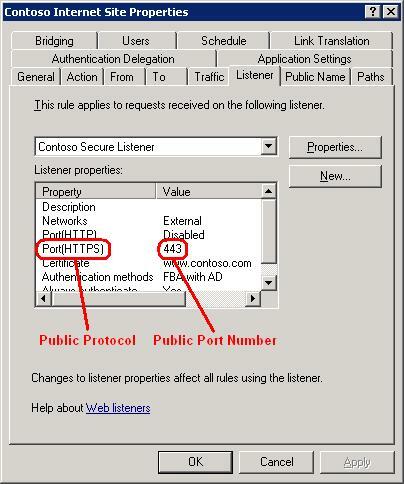 In addition, because the http://sharepoint.perimeter.contoso.com URL is assigned to the Internet zone, Office SharePoint Server 2007 will generate links on the pages by using the public URL for that zone: https://www.contoso.com. This ensures that end users are taken to the proper URL when clicking links on the page. Load balancers work similarly, especially if they overwrite the end user's original URL with the URL of the individual Web server that the request is being load balanced to. To account for these overwritten URLs, just add the alternate access mappings for the URLs of each individual Web server, as internal URLs, and associate them to the same zone as the public URL of the end user. If they preserve the original URL, then simply have the original URL be the public URL. Alternate access mappings allow you to expose a Web application in as many as five different zones, with a different IIS Web site backing each zone. Some people mistakenly refer to this as having up to five different Web applications sharing the same content databases. In reality, there is just one Web application. Not only do these zones allow you to use multiple URLs to access the same Web application, they also allow you to use multiple authentication providers to access the same Web application. When extending a Web application into a zone, you have to use Windows authentication provided by IIS. After the Web application has been extended into the zone, you can modify the zone to use a different type of authentication. Use the following procedure to modify the authentication configuration for a zone. On the Authentication Providers page, select your Web application, listed in the Web Application box. Click the name of the zone whose authentication configuration you want to modify. You will only be able to select from among zones that have a backing IIS Web site. These zones were assigned an IIS Web site during the "Extend an existing Web application" procedure. Modify any other authentication configuration settings that you want to change and click Save. At this point, you can change authentication configuration settings for any other zone as well. You can configure completely independent authentication settings for different zones accessing the same content. For example, you might configure some content to be anonymously accessible while other content requires credentials. You could configure one zone to have anonymous access enabled and all other forms of authentication disabled, guaranteeing that only the anonymous content will be accessible. At the same time, another zone can have anonymous access disabled while NTLM authentication is enabled, guaranteeing that only authenticated access will be allowed. In addition, you can have different types of accounts to access the same content: one zone can be configured to use Windows Active Directory accounts while another zone can be configured to use non–Active Directory accounts with ASP.NET forms-based authentication. Web application policies allow administrators to grant or deny access to accounts and security groups for all sites exposed through a zone. This can be useful for a variety of scenarios. For example, the Office SharePoint Server 2007 search crawler must go through the same authorization infrastructure as everyone else: it can only crawl content that it has access to. However, users would still like search to crawl restricted content so that authorized users can find that content in search results. The search service uses a Full Read policy on the Web applications to give its crawler permission to read all content on that Web application. That way, it can crawl and index all existing and future content, even content that the site administrator has not explicitly given it access to. Another example would be Helpdesk personnel who need administrative access to Office SharePoint Server 2007 sites so that they can assist users. To do this, you can create a Web application policy that grants the Helpdesk staff accounts Full Control permission so that they have full administrative access to all current and future sites on the Web application. Because policies are tied to both Web applications and their zones, you can ensure that the policy you have applied to one zone does not affect other zones. This can be useful if you have content exposed both on the corporate network and to the Internet. For example, suppose you have given a Helpdesk staff account Full Control permission over a Web application's zone that has been assigned to the corporate network. If someone were to try to use that account to access the site over the Internet, that Full Control policy would not apply because it would recognize that the URL is in a different zone. Therefore, the account would not automatically be given administrative access to the site. Office SharePoint Server 2007 allows you to extend the alternate access mapping functionality to content that is not hosted within the Office SharePoint Server 2007 farm. To configure this functionality, browse to the Alternate Access Mappings page and click Map to External Resource. You will then be asked to create an entry for an external resource, which you can think of as another Web application. After you have an external resource, you can assign different URLs and zones to it in the same way that you do for Web applications. This feature is not utilized in Office SharePoint Server 2007, but third-party products that build on top of Office SharePoint Server 2007 can make use of it. For example, the search technology in Office SharePoint Server 2007 is able to crawl content external to the farm such as file shares and Web sites. If that content is available at different URLs on different networks, you would want search to return results by using the appropriate URLs for the user's current network. By using alternate access mapping's external resource mapping technology, search can remap the external URLs in its search results to match the user's zone. Use the following guidance to avoid the six most common mistakes that administrators make with regard to alternate access mapping. The most common cause of alternate access mapping-related issues is administrators not realizing that they need to configure alternate access mappings in the first place. It is certainly understandable because alternate access mappings are a new requirement in Office SharePoint Server 2007. Every Office SharePoint Server 2007 administrator needs to make sure that alternate access mappings are configured correctly, even for a simple deployment. Your alternate access mappings might not be configured correctly if you are experiencing any of the following problems. You see broken images on your site. If you experience DNS error messages or error messages indicating that a server cannot be found when you browse to a site without specifying a filename (such as http://computer_name/site_name), but you are able to access the site if you browse directly to a specified file within the site (such as http://computer_name/site_name/default.aspx), incorrectly configured alternate access mappings might be the cause of the problem. You are redirected to http://computer_name when browsing to your site. If Office SharePoint Server 2007 receives a request from an unrecognized URL (or a URL that has not been configured for alternate access mappings), and you have installed the Infrastructure Update for Microsoft Office Servers, Office SharePoint Server 2007 tries to determine the correct Web application and then responds to the request by using the same base URL in the links on the page that it returns. If the request is from a URL that has not been configured for alternate access mappings, and you have installed the Infrastructure Update for Microsoft Office Servers, Office SharePoint Server 2007 also creates a critical error in the Windows event log, and in the Office SharePoint Server ULS logs, to notify the Office SharePoint Server administrator to configure alternate access mappings for the unrecognized URL. Installing the Infrastructure Update for Microsoft Office Servers in an Office SharePoint Server farm that uses alternate access mappings with a reverse proxy or a network load balancer, such as in an extranet deployment, may cause some public URLs to become unresponsive. Microsoft is aware of this issue and is developing a solution. Before installing the Infrastructure Update for Microsoft Office Servers, customers who use this configuration should use a test environment to verify that public URLs remain accessible after the update is installed. For Office SharePoint Server 2007 to provide a robust and stable API that can work on multiple computers, even computers where the Web application service is not running, the resolution of URLs to sites cannot rely on hosts files, DNS, or IIS bindings. Instead, when Office SharePoint Server 2007 receives a request, it will only use alternate access mappings to perform URL resolution. 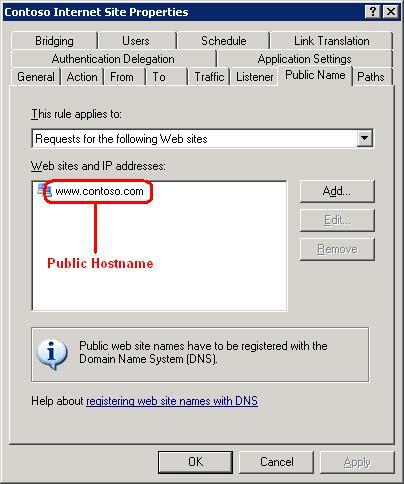 While it is necessary to make sure your hosts files, DNS, and IIS bindings are properly configured to ensure that Web requests can reach the Office SharePoint Server 2007 server, it is also necessary to configure the URLs for alternate access mappings, as shown in the following examples. If you are using an FQDN URL to reach your Web application, you need to configure that domain name in DNS. You also need to configure a matching URL for alternate access mappings. If this is a URL that end users will use to reach your site, make it a public URL. If this is a URL that a reverse proxy server will use to forward requests to your site, make it an internal URL. If the URL is internal, make sure that you have configured the URL of the end user as the public URL in the same zone. Localhost is a special host name that enables you to type http://localhost in your browser and reach the Web site hosted on your local computer. However, because localhost is made available by accessing the computer's hosts file, Office SharePoint Server 2007 cannot automatically take advantage of it. If you need http://localhost to be a valid URL for Office SharePoint Server 2007, you need to enter http://localhost as an alternate access mapping. If you are in an environment in which there is no DNS or hosts name resolution, and you are just using URLs with IP addresses, you still need to enter those URLs as alternate access mappings. In compatibility testing, no link translation feature from any reverse proxy server, including ISA Server 2006, is sufficient to fix all Office SharePoint Server 2007 links to use the public URL. Office SharePoint Server 2007 embeds its URLs in many places and in a variety of encodings. Reverse proxy servers are currently not sophisticated enough to find and fix all of the URLs. There are Office SharePoint Server 2007 functions that do not go through reverse proxy server publishing rules, for example e-mail alerts. Only by using alternate access mappings will you be able to ensure the links in your e-mail alerts are using the correct URLs for your users. If you expose Central Administration by using a publishing rule, make sure the link translation feature is disabled for that rule. If link translation is not disabled, it can interfere with your ability to configure alternate access mapping. This is a mistake that often catches people when they configure Office SharePoint Server 2007 to expose a Web application to both their internal network and the Internet. For example, if you have configured a Web application on your corporate network with "http://sharepoint" as your Default zone URL and you want to expose it to the Internet as http://www.contoso.com, you might configure your reverse proxy server to forward the requests to http://sharepoint and then add http://www.contoso.com as a public URL to the Internet zone. This is a mistake. While access to the site from your corporate network will continue to work as expected, you might find that access from the Internet is not working very well and there are several links pointing to http://sharepoint. This is because the two URLs have been entered into different alternate access mapping zones and therefore are not associated with each other. A URL can be used only once in alternate access mappings, and in the preceding example, the http://sharepoint URL was already in use on your corporate network. To forward your Internet-based requests to the same Web application, use a different internal URL for your reverse proxy publishing rule, such as http://sharepoint.perimeter.contoso.com. You can leave http://sharepoint in alternate access mappings and still add http://www.contoso.com as your public URL in the Internet zone. 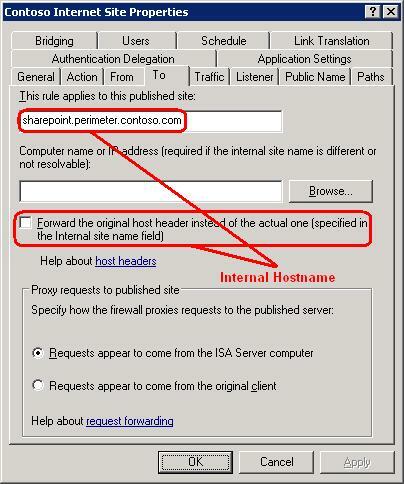 You need to add http://sharepoint.perimeter.contoso.com as an additional internal URL in the same zone as your http://www.contoso.com public URL, your Internet zone. By using both in the same zone, Office SharePoint Server 2007 can generate the correct links using the public URL for that zone. We recommend extending a Web application to a new IIS Web site for each zone you want to use. This provides a backing IIS Web site. We do not recommend reusing the same IIS Web site for multiple zones, unless you are specifically told to do so by Microsoft. After a Web application has been extended to a zone, Office SharePoint Server 2007 will not attempt to modify its IIS bindings. If you modify these bindings in IIS by adding a host header binding, changing a port number, or adding an SSL port, Office SharePoint Server 2007 will not be aware of the changes and will not update the alternate access mapping URLs. Similarly, an update to the alternate access mapping URLs to add an SSL URL will not automatically update your IIS bindings to match. If you need to make a change in your IIS bindings, remove the Web application from the zone by using the Remove SharePoint from IIS Web site link on the Application Management page. This action only removes an IIS Web site and its zone from the Web application. It does not delete the Web application itself, or the content databases of the Web application. Then you can re-extend the Web application to the zone, using your updated bindings. This is also true if you want to add an SSL port. We do not recommend reusing the same IIS Web site for your HTTP and SSL hosting. Instead, extend a dedicated HTTP and a dedicated SSL Web site, each assigned to its own alternate access mapping zone and URLs. If you have configured alternate access mappings and your network to enable end users to reach your sites, you must also configure alternate access mappings and your network for Office SharePoint Server 2007 search. The Office SharePoint Server 2007 Search service browses to your Web applications to crawl their content and must be able to access your public URLs. Make sure that the computer running the search indexing service can reach those public URLs. This is particularly important for any computer that uses NTLM authentication. If necessary, configure the proxy settings of your Office SharePoint Server 2007 Search service account to use your proxy servers. You can do this by logging into the computer as that account, and editing the LAN connection settings in Internet Explorer. Use the following procedure to edit LAN connection settings in Internet Explorer. From Control Panel, open Internet Options. On the Connections tab on the Internet Options properties page, click LAN Settings. Edit the LAN connection settings in the Local Area Network (LAN) Settings dialog box, and then click OK.
Make sure that the URLs in alternate access mappings are entered correctly. If you are using a reverse proxy server, verify that URLs in the alternate access mappings match the URLs in your publishing rule.